Early childhood is considered a critical but often vulnerable period in a child’s development where early identification and intervention can be crucial for improving children’s developmental outcomes. Systems and family-centred perspectives are vital to support families and build their capacities to lead normalized lives with improved family quality of life. This book explores the family-centred practices and systems factors which influence families’ experiences raising children with complex needs. It also considers the ways in which professionals can work with families to build and support parent and child competence. Conceptual and practical work from Australia, Canada, Europe and the United States present descriptions of and implications for different family system frameworks and early-childhood programs. 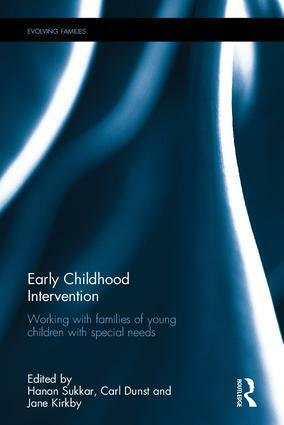 Contributors in this edited volume bring together contemporary information that bridges the research to practice gap in supporting families of young children with disabilities or delays. Family Composition and Family Needs in Australia: What Makes a Family? This book will attract the attention scholars of Parenting and Families; Child Development and Childcare. Hanan Sukkar is the Course Leader for the Bachelor of Early Childhood Education at Holmesglen Institute. Over the last 20 years, Hanan has had extensive experience working with families at risk and children with disabilities. Hanan has operated at director level assisting vulnerable families on welfare in USA and at management level overseeing new migrants in Australia. She has also worked with the Government of Victoria focusing on early intervention, and has held academic positions with Deakin University and Monash University. Hanan has most recently worked as a Senior Associate Research at Semann & Slattery. Hanan’s research draws on early childhood intervention and social evaluation. Carl J. Dunst is a Senior Research Scientist at the Orelena Hawks Puckett Institute, Asheville and Morganton, North Carolina, USA. He has been involved in research and practice with young children and their families for more than 40 years. This work has included the use of family and social systems frameworks for investigating the direct and indirect effects of informal and formal supports on child, parent, and family functioning, and the use of family-centered practices for improving the outcomes associated with early childhood intervention. This research and practice has resulted in a number of frameworks and models for conceptualizing early childhood intervention practices. Jane Kirkby is an academic at Monash University, Melbourne where she lectures in English literacies and curriculum, assessment and pedagogy units in teacher education courses. She is an experienced teacher and school leader, having worked across the early childhood, primary and secondary school levels for 30 years. Jane has implemented major school change initiatives, which involved building relationships and capacity with teachers, administration, parents and community stakeholders. Her research focusses on teachers' professional learning, knowledge exchange and mentoring relationships and with current projects being conducted on boundary crossing in the Early Childhood sector.